We all know that it is hard to let go of long loved items, but life circumstances sometimes necessitate to slim down a collection to make more space for new creations. On this permanent page I will, on an ongoing basis, put up items that are for sale. They are all well cared for, naturally saw some use (as you can spot them on some of my photos), but are in pristine condition. The prices represent material costs and time involvement, however, I am open for reasonable offers, especially if you would like to get a number of items in one go. The miniature to the right is a 28mm Reaper miniature, the two Numidians to the left 15mm Corvus Belli. 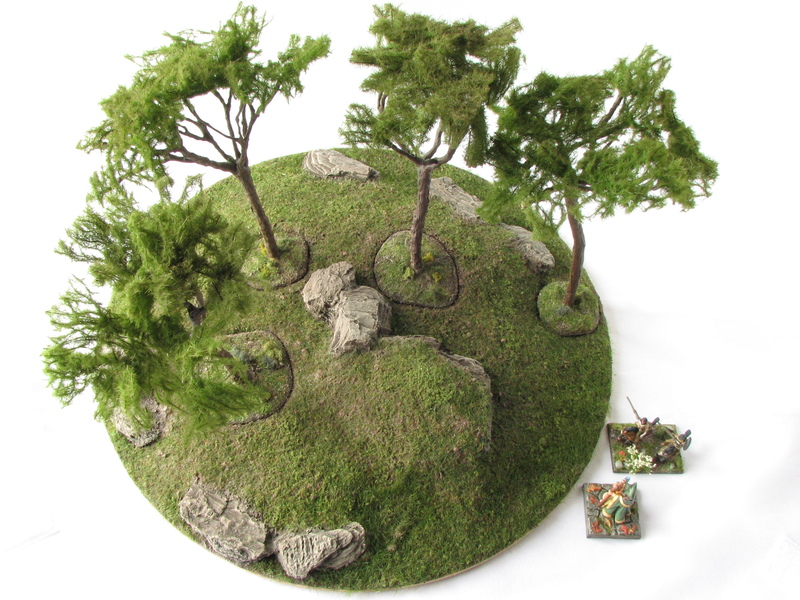 The miniatures are not included and only serve to get an impression of the size of the trees and base. The sides of the base will naturally be painted before shipping. All trees feature MiniNatur foliage nets, are made of sturdy wire (however they are slightly bendable and thus very resilient) covered with a mix of poly filler and acryl medium. 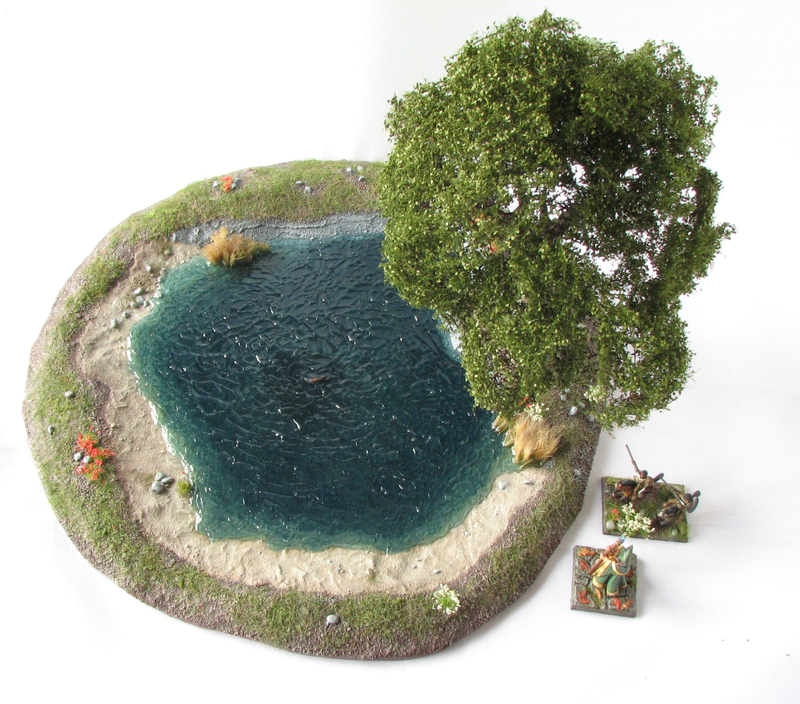 Every tree is slightly different and comes with a magnetised base. 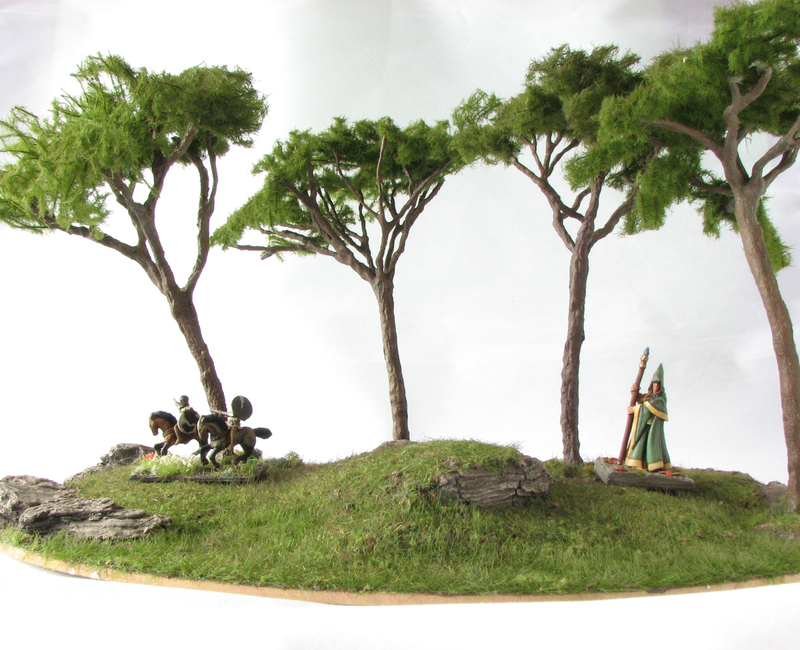 The trees can be removed from the scenic base to allow easy placement of troops. Price exclusive shipping: 130 NZ / 80 Euro / 90 US / 60 GBP. Weight: 481g the base and 127g the four pine trees. Makes 608g . Dimensions: The base has a diameter of 30cm (approx. 12inch). International shipping: The box plus shipping material weighs approx. 750g. Australia: 18.64 NZ (tracked 33.48 NZ). ROW: 42.49 NZ (64.34 NZ). 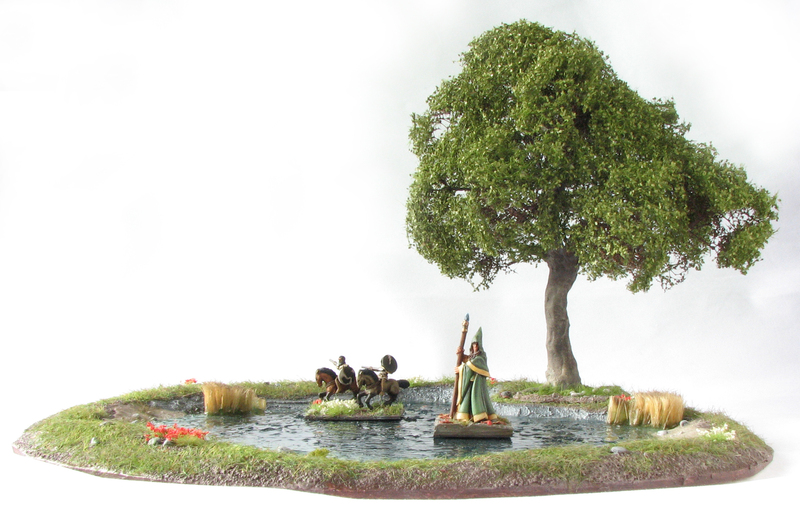 The tree can be removed from the scenic base to allow easy placement of troops. 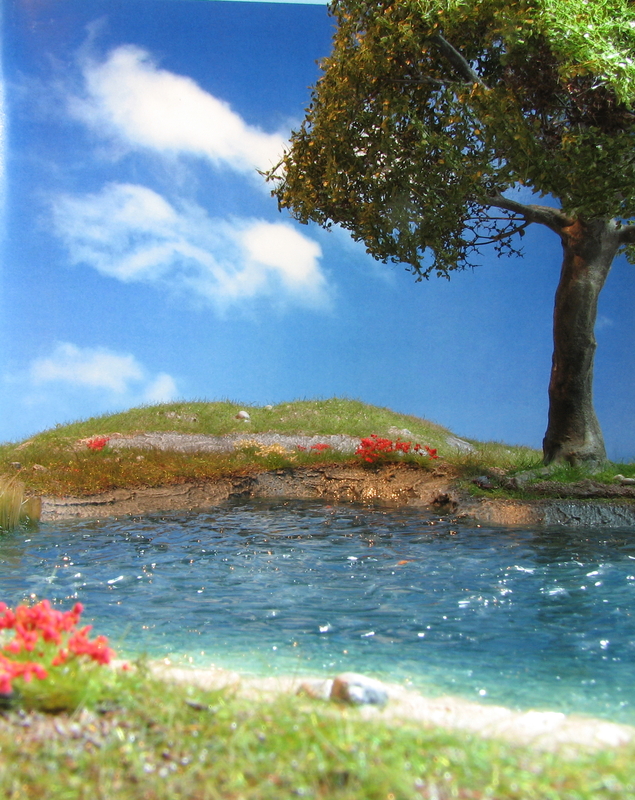 The lake features some fish in the water and one fish on land under the tree (good place for a fisherman). The water is tinted Epoxy Resin. 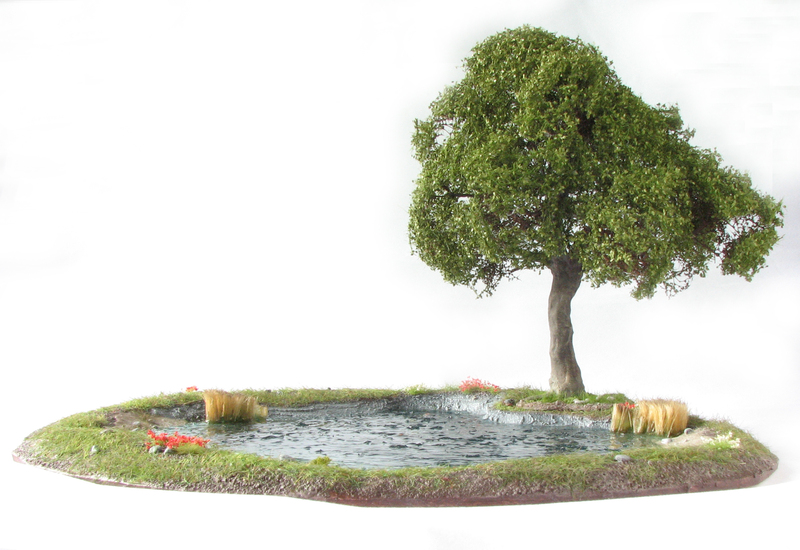 The tree is about 18cm high and made using seamoss and MiniNatur foliage nets, thus it has realistic ramifications. The tree depicted is a stone oak with its characteristic smooth, grey bark. Price exclusive shipping: 120 NZ / 75 Euro / 90 US / 60 GBP. Weight: 369g the base and 58g the tree. Makes 427g. Dimensions: The base has a diametre of 30cm (approx. 12inch). Australia: 16.89 NZ (tracked 32.13 NZ). ROW: 37.99 NZ (tracked 60.96 NZ). 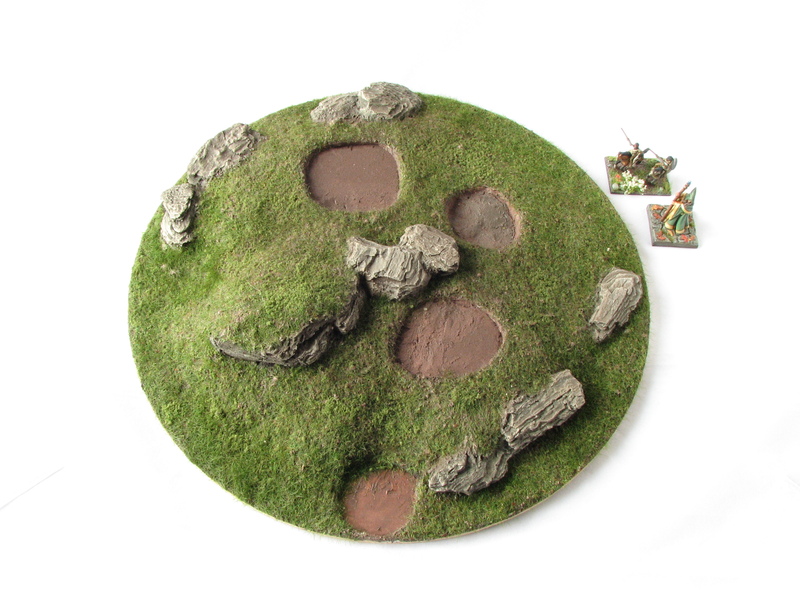 The barren tree is magnetised and can be removed for transport and movement of troops. The snow is fixed in place and matt varnished to prevent it from rubbing off. 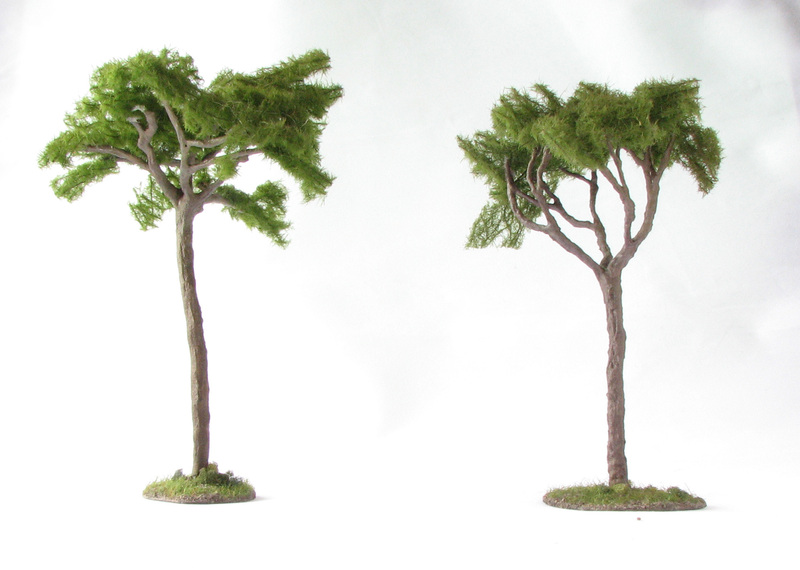 The smaller tree is not removable but quite flexible and painted with chip resistant paint. 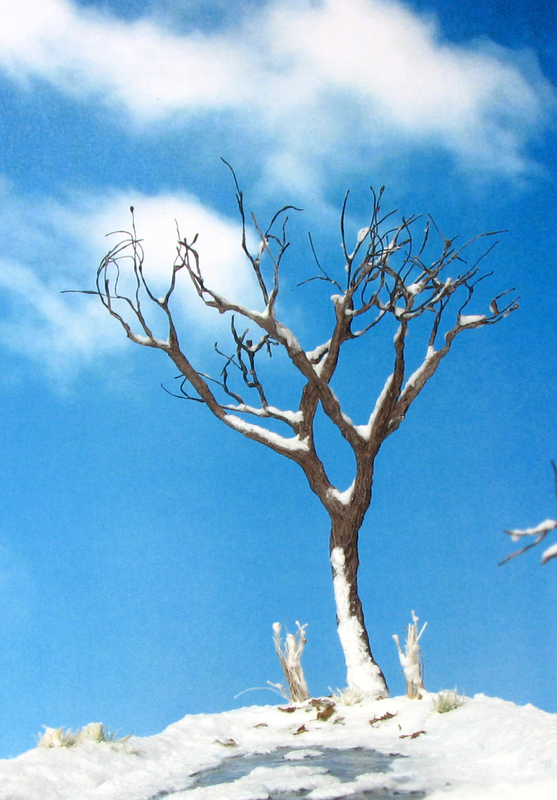 The barren tree features a realistic bark, snow drifts and realistic ramifications made of copperwire. 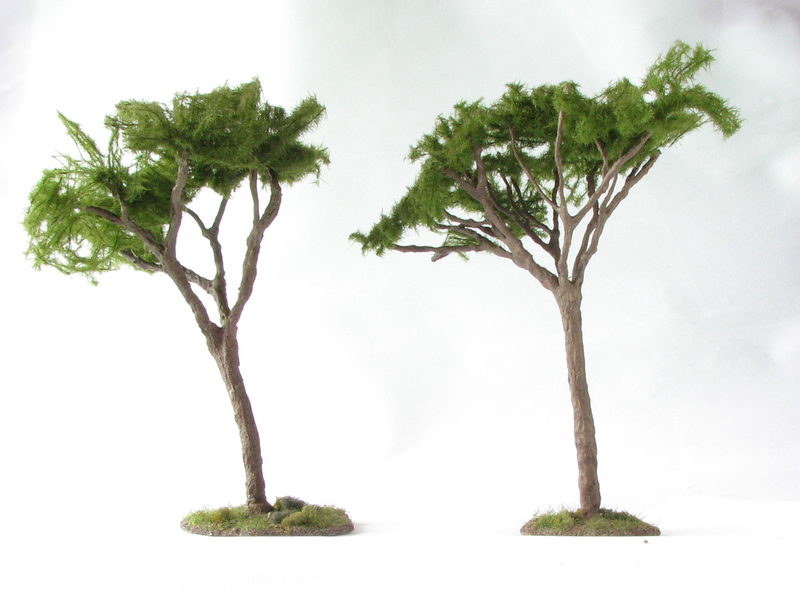 These are slightly flexible, while bigger branches are made of sturdy steel wire. International shipping: The box plus shipping material weighs approx. 250g. I am based in Auckland, New Zealand. Accordingly overseas shipping will be more expensive than domestic and depends on the weight of the item(s). I include with each item the weight and an estimate of what the parcel with packaging (protective bubble wrap and filler) would add. International shipping costs for the item are based on this. If you would like to buy a number of items, you can go to NZ Post’s Rate Finder and get an estimate what international shipping would cost. In general shipping costs starting with 30 NZ Dollars can be expected for any country other than Australia. I am happy to do tracked shipping if you want the added security. I always charge you the actual shipping costs, plus 5 Dollars to cover packaging and handling. Domestic shipping will be done via Pass the Parcel. This affordable service offers nationwide tracked and insured shipping for a reasonable price. Prices depend on your location and seize of the parcel. Weight is not important, as up to 25kg are covered. Local boxes are always 5.00 Dollar, no matter the size. Same island range from 10 to 14 Dollars and between islands ranges from 12 to 20 Dollars. I send out items within 3 working days after payment has been received. If there are any problems or delays on my side I will let you know. I will provide the tracking number as soon as it is online. If there is no tracking number please let me know when the parcel arrives or inform me within 14 days if the parcel did not show up yet. Given these are private to private sales and the goods are used, I cannot replace any lost items or refund you if you choose a non tracked overseas option and the parcel goes astray. I will however help with the investigation. In case of tracked and insured shipping I need your cooperation, so that a refund request with the postal service can be made within the deadline of 14 days after sending. However, tracked parcels are normally not an issue, so there should be no problems. I can also not refund you due to damage caused by the postal service or force majeur. However, I take great care to securely ship items. I use bubble wrap, spacers and foam chips to make sure the items are not moving, are secured against impact and arrive in perfect condition. Payment can be made by either NZ bank transfer, if you are in NZ or via Paypal if you are international. Payment details can be exchanged by email. Please use my Contact page. Pickup in Auckland is also possible if you want to save the shipping costs. Firstly i must commend you on such beautiful creations. I am so pleased to have found your site. I would love to purchase the frozen lake w tree, please let me know how to proceed with payment. Thank you, glad you like my stuff. The lake is still available and preferred way of Payment is either Paypal or bank transfer if you are in New Zealand. I will be out of the country beginning this Sunday for some time, so I could leave the parcel with a friend to send it out next week. If you send me an email we can discuss the details. Hi Rory, I am back in New Zealand. Please let me know either here or preferably via the contact form if you are still interested. 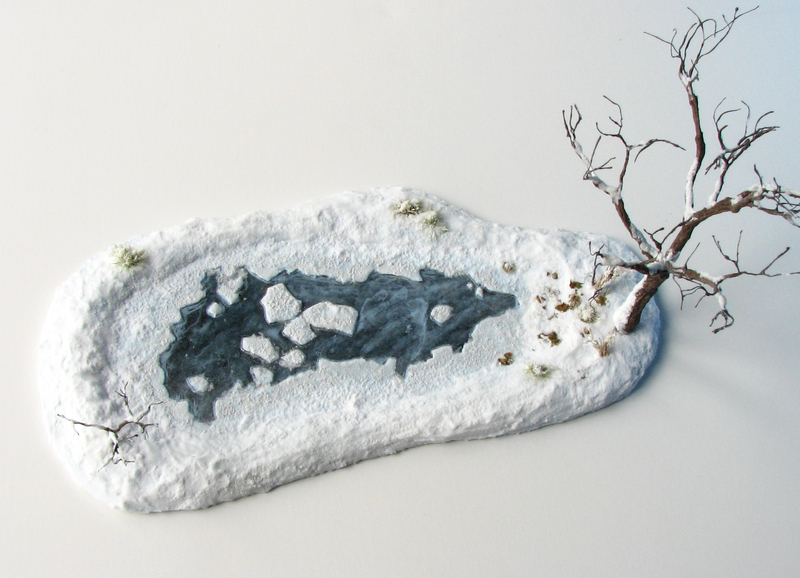 I also have two snow covered trees available for purchase, if you want to add to the lake.